Case study: Migrating from Ning to WordPress & BuddyPress - Gizmo Creative Factory Inc.
Definitely watch this space: One of my favorite clients, Chicago acupuncturist Mitch Harris, already runs a WordPress site and knows its ins and outs. But, he also had a Ning site with 300+ members for a growing Eastern nutrition and recipe site, Food From East, fed by his Pacific College students. As Ning kept increasing their hosting rates for an undoubtedly useful set of tools, it also became unwieldy and didn’t really fit Mitch’s needs. Too, he wanted to make it more of a resource on Eastern nutrition, for both practitioners and the public alike. Enter WordPress, BuddyPress and the awesome WPMU Ning to BuddyPress Importer plugin. BuddyPress, for the uninitiated, is all about making your WordPress site social. It can make it a sort of Facebook “lite,” and is ideal for education, your private or public niche membership site, or really, anything you might have thrown on Ning before. Now, this won’t solve all your problems: The taxonomies between Ning and WordPress are different, and everyone posts things in different areas depending on how they originally set up Ning. Though the migration was pretty painless, we are still cleaning up comments and posts that ended up in the wrong places, and are tagging and categorizing everything [which is no small task on some sites]. But, it also gave me a chance to create a better user experience: With just a “quick edit” of categories & tags, and with better labels for the user—there now are sections for disorders, symptoms, ingredients, and practictioner-speak. It’s a much better experience. With plugins like Mass Categorization, we can even create these en masse. This migration really gives you a chance to review where data is, where it will be imported, and how you want it displayed. Comments, for example, cannot have categories or tags, but if they’re correctly placed under a relevant post with the right tags and categories, they’re still findable. I’ve written quick WordPress guides for members moving over to this new site, focusing on images, as Zemanta and PhotoDropper are instrumental and not obvious to new users. As easy as WordPress is, plugins are not always intuitive. Now we haven’t set up forums or groups, as he doesn’t need them yet, but this again is a quick import over from Ning, and preserving your members’ conversations is incredibly important for a growing membership site, especially in terms of SEO. The best thing, IMHO, is every user and his or her avatar moved over to the new site with all of their information, and Mitch can send everyone a personalized email telling them where to find their new member site, and log in using their old login and password, or get new credentials. The connections between their posts and comments stay correct. This is what migration should be. And, as each user can create a full-fledged profile, instant message each other and generally have a much better experience, and it’s a clear winner over Ning, especially without the monthly fees. Boone Gorges of Teleogistic has been incredibly helpful in answering questions and an ongoing discussion with other users of this plugin—after all, no migration is perfect, so be prepared for flukes and figuring out data workarounds. But the data is intact, which is more than half the battle. On the downside for BuddyPress: It’s incredibly popular among spammers. They’ll create accounts, post spam and generally create headaches. I’ve vacillated between Bad Behavior and WangGuard (July 2017 note: WangGuard is now discontinued, but check out WPMU’s Anti-Splog. It’s pricey but works.) for blocking spammers, and I’ve a few more tips in my BuddyPress presentation from May. Overall, it’s a win: Improved user experience and less expensive & better WordPress admin. Features can be turned on and off at will, and you can encourage better engagement with a suite of tools. Now, where’s that next BuddyPress project? We’re already lucky to have 30% of the world’s websites powered by WordPress. And WordPress themes are big business, with many developers and companies launching new themes every day. But what do you look for? Here’s a checklist for choosing a WordPress theme. It seems ubiquitous that so many websites are on WordPress — 30% of the web, by last count. 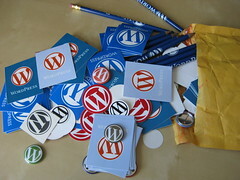 WordPress powers the UPS site, CNN, the NFL site, the Dow Jones site, and many, many more. If you’ve not had a chance to learn about site structure or information architecture for your website, you’ve got no excuse now! My 2014 Chicago WordCamp talk on it, A House with No Walls: Creating A Site Structure for the Future is now live on Wordcamp.TV.